The Government Relations Committee identifies areas of governmental policy that affect student and educational interests and formulate and recommend educational policy positions. Acting as a liaison with the NACAC Government Relations Committee, the members of the Committee coordinate efforts to keep PCACAC members informed of current issues in college admission counseling and educational policy at the state and national levels. The Committee also serves as a resource for legislators on issues concerning the transition from high school to college, college access for students educational policies for college admission. For access to several actions you can take to support our profession, your students, and their families, please see FREQUENTLY ASKED QUESTIONS below and visit our Legislative Action page. Please be sure to make your voice heard on these issues. Contact Ginger Miller with questions. The Government Relations Committee has been hard at work planning our advocacy events for the coming year. These advocacy events give us an opportunity to meet with legislators and share with them the projects PCACAC members are working on, the priorities of our industry, and other challenges that we face in our roles as counselors and higher education professionals. A huge "Thank you!" to those who attended (left to right in the photo above): Ginger Miller, Government Relations Chair; GRC committee members: Rachel Cleaver, Erika Davis, Natasha Blake-McDowell, Alicia Oglesby, President Jake Talmage, Melissa Hypolite, President-Elect Joel Lang, GRC Vice Chair Nick Orban, Katie McEnroe, and Dan Zawacki. Missing from the photograph but so glad they could join us are are NACAC Research Associate Pooja Patel and Lucien Giordano from Dulwich College of China. 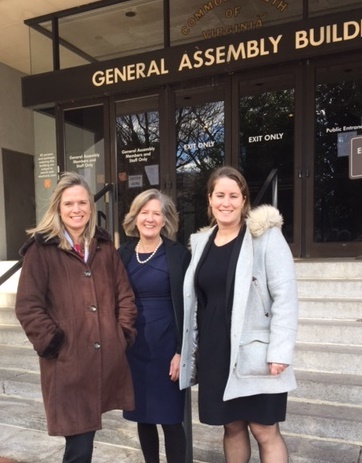 On February 13, members of the Government Relations Committee (GRC) participated in PCACAC On-the-Hill in Annapolis, MD where they attended several meetings with key legislators and aids to discuss important issues to our profession and to advocate for YOU. There appears to be a lot of support for our policy initiatives, and there were already some bills submitted that we are excited about -- including opening access to Delegate and Senatorial Scholarships to DACA and DREAM Act students. Additionally, our GRC advocated for increased resources for counselors and schools, as well as informing students about the dangers of for-profit institutions. From left to right in the photo: Jake Talmage, current PCACAC President; House of Delegates Speaker Pro Tempore, Adrienne Jones; Government Relations Manager for NACAC, Julie Kirk; and, Nick Orban,Vice-Chair of Government Relations for PCACAC. 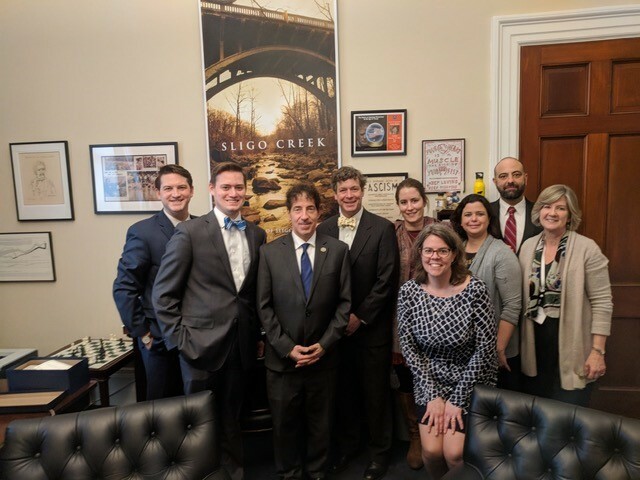 Members of the Government Relations Committee (GRC) participated in PCACAC On-the-Hill in Richmond, VA where we attended seven meetings to advocate for YOU! We are grateful for our Virginia team (left to right): Karla Taylor from Hanover Co. Public Schools, Rachel Cleaver and Eva Bramesco from George Mason Univ., GRC Chair Ginger Miller, Past President Anthony Ambrogi from St. Catherine's School, and NACAC's Director of Gov't Relations, Mike Rose. Watch for information here and in the next Anchor Splash about our Annapolis, MD PCACAC On-the-Hill - led by our GRC Vice Chair, Nick Orban. PCACAC Government Relations Committee member, Rachel Cleaver, ran an informative panel discussion and training for Senate education staffers at George Mason University. Her continued commitment to legislation and funding affecting first gen and undocumented students is indicative of our best outreach and work for access to college. GRC Chair, Ginger Miller, was so pleased to participate and learn with George Mason’s amazing students! "On Thursday, May 3, George Mason University was honored to partner with Third Way think tank and District of Columbia Public Schools to host a training for twenty five Senate education staffers. The event focused on best practices for supporting first generation and underrepresented students. The day began at H.D. Woodson High School and then moved to George Mason in the afternoon. While on Mason’s campus, staffers heard from staff who support first generation students about the work that they do every day as well as from a panel of first generation students who conveyed their personal stories. The Senate staffers also had the opportunity to work through real life scenarios to help bring the successes and struggles of first generation students to life. George Mason was honored to share our best practices, but also stressed that there are colleges across the country doing amazing things to support our students. We encouraged the staffers to be champions for our students and create and support legislation that will allow colleges to continue supporting first generation college bound students. Overall, the day was a huge success and we look forward to a many collaborative trainings with Third Way in the future." PCACAC's Government Relations team participated in NACAC’s advocacy day on the Hill. Government Relations Chair Ginger Miller, and Vice Chair, Nick Orban, were joined by David Burge (NACAC President), Robyn Lady (PCACAC President), Anthony Ambrogi (PCACAC Past President), Jake Talmage (PCACAC President-elect), and GRC members Katie McEnroe, Costos Solomou, Chris Butler; Dan Zawacki, and Rachel Cleaver. In addition to working with our lobbyist Mike Rose, Director for Government Relations, on Sunday, February 25th, we met with legislators and their aides from Delaware, Maryland and Virginia. Our meetings involved stimulating discussions with Members of Congress and staff, including Congressman Don Beyer and Assistant Kate Schisler, Congressman Jamie Raskin and Legislative Director William Roberts, Lauren Marshall, Assistant to Senator Warner, Cortney Segmen, Legislative Fellow with Senator Kaine, Ian Spears, Legislative Assistant to Congresswoman Lisa Blunt Rochester, and Sarah Schenning, Assistant to Senator Van Hollen. We advocated for a lower student/counselor ratio to provide quality counseling for post-secondary options with careers and college choices. We addressed the need to increase mental health and school safety. We supported student loan protection while pushing for the halting of the burden created by for-profit colleges. We urged legislators to get DACA done, and we pushed for a 1.6 billion budget to fully fund educational needs with Title VI Part A which provides, among other things, professional development for counselors. Counselor relicensure in Virginia to include some required hours in the required professional development 180 hours be allocated to college and career counseling. We also entered a discussion about possible SAT testing in high schools to give access to all students addressing the possible tradeoffs of such an event. The most important take away is that we had a voice, advocating on behalf of NACAC as well as PCACAC at a time when federal funding is clearly affecting state funding for very important programs involving access to higher education and quality counseling. Delegate Lopez is extremely supportive of access in education, and among other bills, is currently is sponsoring HB19 to cover DACA students with in state tuition in Virginia regardless of whether or not the federal government arrives at an immigration solution for Dreamers. A special thanks to Nick, Jake, Katie, Adrian, and Karina, who were able to lend their experiences and make a huge impact regarding the importance of what we do as admission professionals. College enrollments in the U.S. decline for a sixth straight year -- although at a slower rate. Higher Education Act. The House Education and the Workforce Committee approved legislation that would reauthorize the Higher Education Act (the Republican drafted text, fact sheet and summary). The next step is for the House of Representatives to debate it, which may happen in early 2018 (the Senate may take up its version of the reauthorization in 2018). Here’s a summary of the Committee’s debate on the bill and more information on specific programs, including public service loan forgiveness program; gainful employment, HBCUs, minority-serving institutions, and community colleges. The bill is likely to negatively impact revenue at public colleges and universities, according to Moody’s. Republican proposal could create a bigger role for private industry in higher education. Tax Reform. Congress passed legislation that would significantly alter the nation’s tax policies. President Trump is expected to sign it into law. Here’s what the GOP’s proposal to overhaul the tax code means for schools, students and parents; its impact on parents with kids in college; the impact K-12 education and higher education. More broadly, here’s what did and did not make it in to the final version. Republicans in state capitals across the country find themselves in a bind as they try to reconcile the tax bill and their own state budget requirements. Tax bill could trigger historic spending cuts and 10 other takeaways. Government Funding. As of press time, Congress needs to pass some sort of legislation (a continuing resolution is most likely) to keep the federal government open. However, there is confusion about how the bill will be crafted. DREAM/DACA. Three dozen Republican lawmakers have called on party leaders to help enact a permanent solution for Dreamers by the end of the year, however Congressional leadership has indicated that they will wait until 2018 to do anything. Here are four possible options available to lawmakers. For their part, Democratic leaders will not force a government shutdown showdown over relief for young undocumented immigrants, which likely pushes any solution until 2018. Meanwhile, undocumented high schoolers work long hours, putting college further out of reach. Graduation Rates. The national graduation rate for a four-year cohort is now 84% after five years of steady increases, a record high. PCACAC is proud to be supporting the 2017 Child and Youth Advocate Dream Act Letter to Congress, sent earlier this week. Thank you for supporting immigrant children and youth during this urgent time! A message from CLASP: "We're excited to share the final Dream Act letter from children and youth advocates, with more than 320 national, state, and local organizations from across the country! The letter was sent to Congress this morning, and we also issued a press release in partnership with the American Academy of Pediatrics, Children’s Defense Fund, First Focus Campaign for Children, The Children’s Partnership, and the Forum for Youth Investment. The press release is available here and below. Thanks again to all of you for supporting immigrant children and youth during this urgent time. For those of you who represent state and local organizations, we invite you to issue your own press release. Attached is a release template you can modify for your own purpose, including state-specific information on the number of DACA recipients. We also ask that you help us share the letter over social media. You can retweet this: https://twitter.com/CLASP_DC/status/910528791734374400 and below are some sample tweets you can use as well. Finally, to learn more about how you can help support Dreamers and advocate for the Dream Act, please see CLASP's new fact sheet on the DACA rescission and visit our DACA resource page. #DreamAct is smart policy for #DACA youth, their families, & our nation. We joined 300+ orgs in a letter to Congress http://bit.ly/2wGtUhh"
Take a look at NACAC's policy briefs and general legislative priorities on our NACAC page. 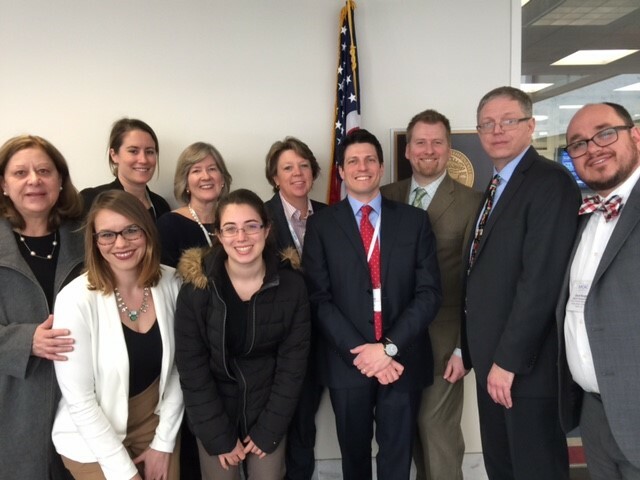 Throughout the morning on Monday, January 30, 2017, PCACAC's GRC comprised of high school counselors and college admission counselors held a series of thirty-minute meetings with several Virginia senators, delegates, and legislative aides in the offices of Senator Saslaw, Delegate Pogge, Senator Howell, Senator Newman, Delegate Greason, Delegate Lopez, and Senator Landes. 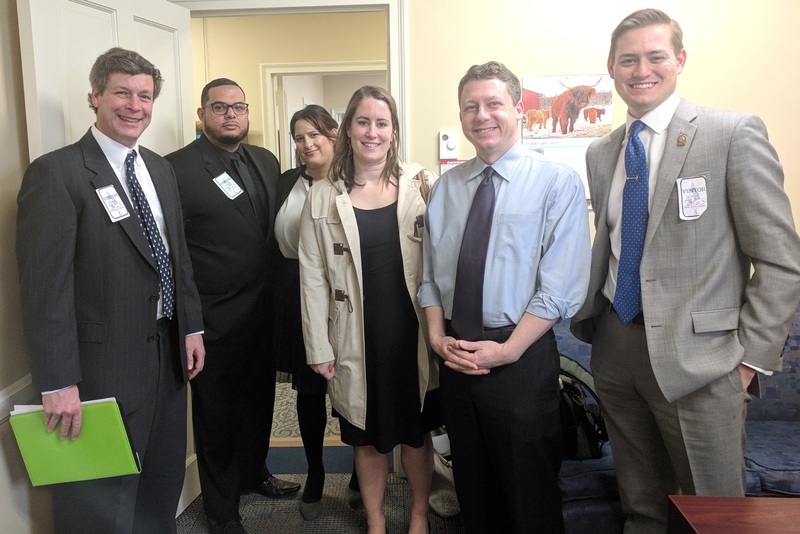 Our primary purpose was for PCACAC members to connect with members of the Virginia legislature to discuss issues concerning access, preparation, and funding for post-high school education. Acting as the voice for students who have none, we thank those who joined us to speak on behalf of students across the Commonwealth to ensure equal access to post-secondary options and success. 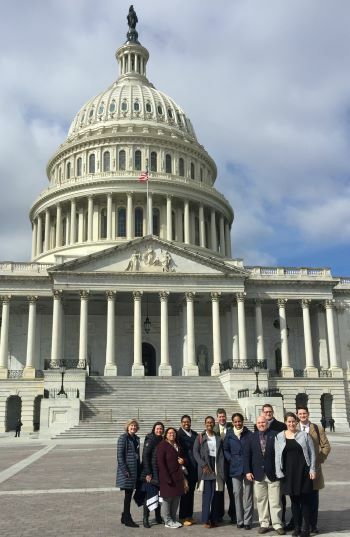 What an interesting day we educators had at the Advocacy training Sunday, March 4, 2017 and the NACAC Advocacy Day Monday, March 5 on the Hill in D.C. as we contemplated issues concerning access and equity in higher education. Since it appears that President Trump’s new budget will include significant cuts, we want to protect funds for education, and especially counseling, because research demonstrates that students who receive academic, career, and college counseling are more successful than those who do not. We support full funding for Title IV, Part A with the block grant for all areas of education. In addition, we hope to secure the Bridge Act for DACA students to ensure stability for them and their families. We also support HR-977 to put counselors where they are most needed and in areas where they do not exist. We support international students who increase our cultural awareness and broaden our global viewpoints while simultaneously contributing to our American economy. Thanks to all who attended and contributed to the success of this day. PCACAC's GRC hosted a breakfast meet-and-greet in the GAB (General Assembly Building) in Richmond. Del. Alfonso Lopez (D-49th) was acting in the role of legislative sponsor for this event. Our primary purpose was for PCACAC members to connect with members of the Virginia legislature to discuss issues concerning access, preparation and funding for post-high school education. Acting as the voice for students who have none, we thank those who joined us to speak on behalf of students across the Commonwealth to ensure equal access to post-secondary options and success. In partnership with the Delaware School Counselor Association, PCACAC-on-the-Hill Dover was held on Tuesday, June 16, 2015. Acting as the voice for students who have none, PCACAC representatives spoke on behalf of students across Delaware to ensure equal access and success to post-secondary options. Members who attended had the opportunity to meet with Delaware lawmakers and their staffers to advocate for the rights of students in the college admission process. The meeting was set up in a delegation room in the Delaware Legislative Hall Building, where legislators and their staffers engaged with members of PCACAC to discuss strategies to best ensure that high schoolers have the resources they need to make informed decisions about their collegiate choice. Lunch was provided to legislators and their staffers and current high schoolers who are going through the admissions process or college students who had a positive college counseling experience were invited to attend. Acting as the voice for students who have none, on March 18, 2015 the GRC spoke on behalf of students across Maryland to ensure equal access and success to post-secondary options. 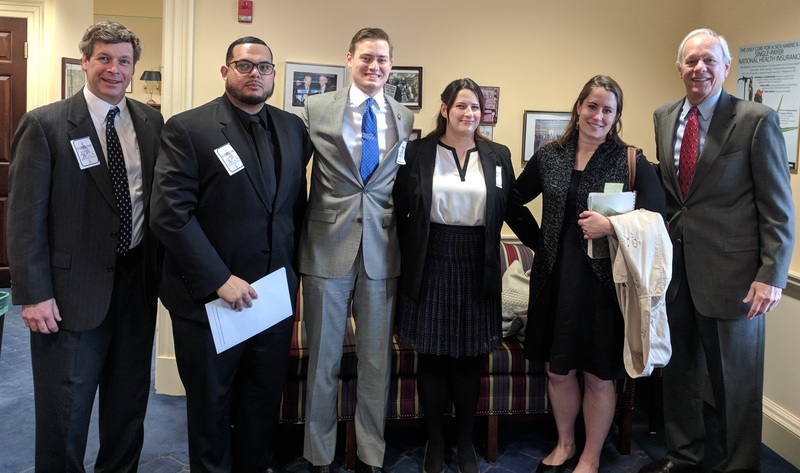 Participants met directly with Maryland lawmakers and their staffers to advocate for the rights of students in the college admission process. The event was held in a delegation room and legislators and their staffers had the opportunity to engage with members of PCACAC to discuss strategies to best ensure that high schoolers have the resources they need to make informed decisions about their collegiate choice. Lunch was provided, courtesy of PCACAC, to legislators and their staffers. Current high schoolers who are going through the admissions process or college students who had a positive college counseling experience were invited to attend. 2013 recipient Jayne Fonash has been a dedicated member of the Potomac and Chesapeake Association for College Admission Counseling and NACAC’s Government Relations Committees. Following her PCACAC presidential cycle, Fonash assumed the chairpersonship of her affiliate’s Government Relations Committee and immediately increased its membership. She coordinated the committee members’ participation in Advocacy Day events in Maryland and Virginia during the 2013 legislative sessions and spearheaded PCACAC’s efforts to pass the Virginia Dream Act, even testifying before the House Education Subcommittee. On the national level, Fonash has played a key role in helping prepare members for the annual Day on the Hill, held each March. Fonash also saw the need for a Town Hall style meeting to provide a forum for legislators and college admissions professionals to share information and strategies to support increased access to higher education for students. An Imagine Grant was awarded to fund this endeavor and plans are moving forward to hold the first PCACAC Town Hall meeting in early October 2013. Thanks to Fonash’s leadership, dedication, knowledge of public policy, and vision to coordinate new initiatives, PCACAC members are more involved with public policy and legislative initiatives than ever before. I want to get involved and support the efforts of the Government Relations Committee, but I don’t have time to attend meetings or travel for legislative visits. What can I do? The easiest thing you can do is to use the links on this page! From here, you can search for current state and national legislation that will affect you and your students and make use of pre-written letters to sign and email to your current legislators. Your voice needs to be heard by legislators at all levels of the government! You are on the front line in dealing with the policies and laws and the only way to change the ones that are not working and to develop better policies is to communicate your opinion. 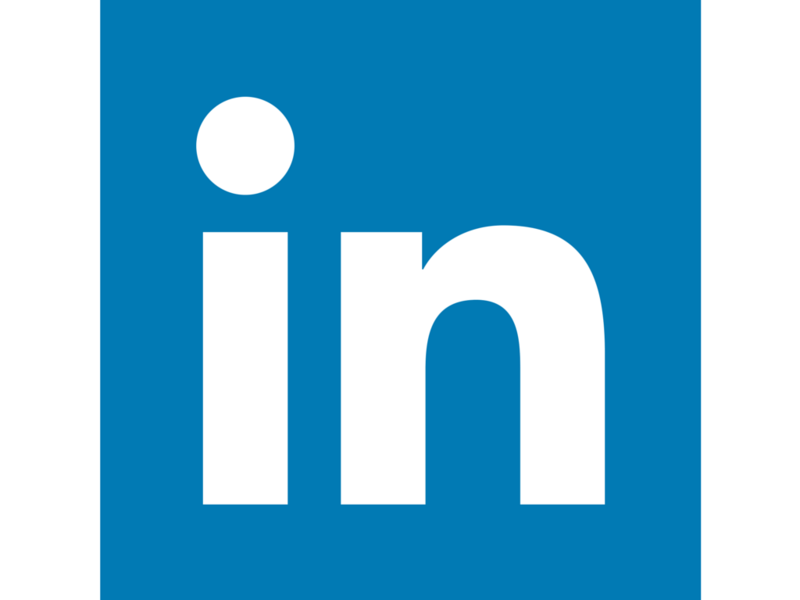 The links on this page will make it easy for you to do it. Bookmark the sites and make a habit of checking up on what is happening in your state and at the federal level.